TAOISEACH LEO VARADKAR has said Ireland rejoining the Commonwealth is “not something that’s on the agenda”, after comments made by the DUP’s Jeffrey Donaldson yesterday. Addressing an audience at the Fine Gael National Conference yesterday, Donaldson said he would like to see Ireland back in the Commonwealth. However, this afternoon Taoiseach Leo Varadkar told RTÉ’s The Week in Politics that joining the Commonwealth is “not something we’ve given any consideration to as a government”. “It’s not something that’s on the agenda, at the moment anyway”. Varadkar explained that he believed Ireland could “re-empower and boost” the institutions of the Good Friday Agreement, such as the British Irish Intergovernmental Conference and the British Irish Council. Tánaiste Simon Coveney was also asked about to possibility yesterday, to which he said it was not on his agenda. Speaking of Brexit during his interview, Varadkar said he should not interfere with the United Kingdom’s internal politics and that “people understand why I can’t do that”. He added that “whoever the prime minister is, we will work with that prime minister”. 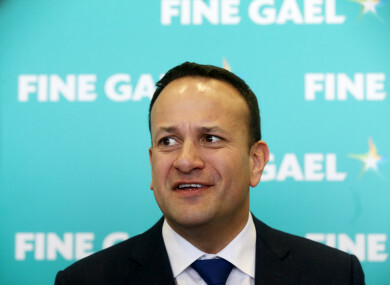 Varadkar added that the government had ensured that it has had good links with the UK government, not just at the Taoiseach/Prime Minister level. He went on to say that the UK is now “consumed” by Brexit. “Even after they leave and let’s assume they leave with a withdrawal agreement in a few weeks time, they will spend two or three years consumed what the future relationship is like,” Varadkar said, adding that it is important that Ireland is not consumed or defined by Brexit. Email “Varadkar says Ireland rejoining Commonwealth is 'not something that's on the agenda'”. Feedback on “Varadkar says Ireland rejoining Commonwealth is 'not something that's on the agenda'”.